Facts about Clyde Ikins Water Lilies. 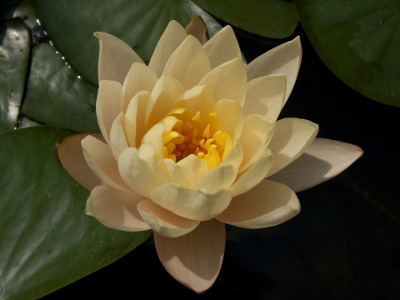 The Clyde Ikins Water Lily is known for its conspicuous flowers that are huge and cream yellow in color. The young plant is usually colored yellow but as they mature, their coloration changes to a stunning orange-peach. This usually happens in midsummer because of the favorable temperatures, humidity and other enabling atmospheric conditions. As opposed to other varieties whose flowers last a short time, the Clyde Ikins Water Lily flowers stay open for longer hours. The bloom season for the Clyde Ikins Water Lily stretches all the way from spring to frost. This essentially means that they are prolific bloomers cutting across all the seasons. The flowers have a unique and sensational creamy yellow coloration with a slight hint of pink. The Clyde Ikins Water Lily yellow coloration gives way to a shade of light yellow apricot in the inner petals. However the anther color is bright yellow while the sepals have a creamy white interior inundated with faint pink on its edges. The Clyde Ikins Water Lily flowers range between 4 and 6 inches (10 to 15 cm) in size with around 34 petals. The Clyde Ikins Water Lily have a strong fragrance. If you are considering growing the Clyde Ikins Water Lily as part of your flower portfolio, you need to be careful about the fertilizers that you use. The recommended quantity of fertilizer is 4 to 6 tablets every month. This should be combined with an enabling environment. The environment where Clyde Ikins Water Lily flourish and blossom without any limitations should be characterized by full direct sunlight with intermittent periods of shade. The Clyde Ikins Water Lily of lilies can transform your pond into an admirable scenery.